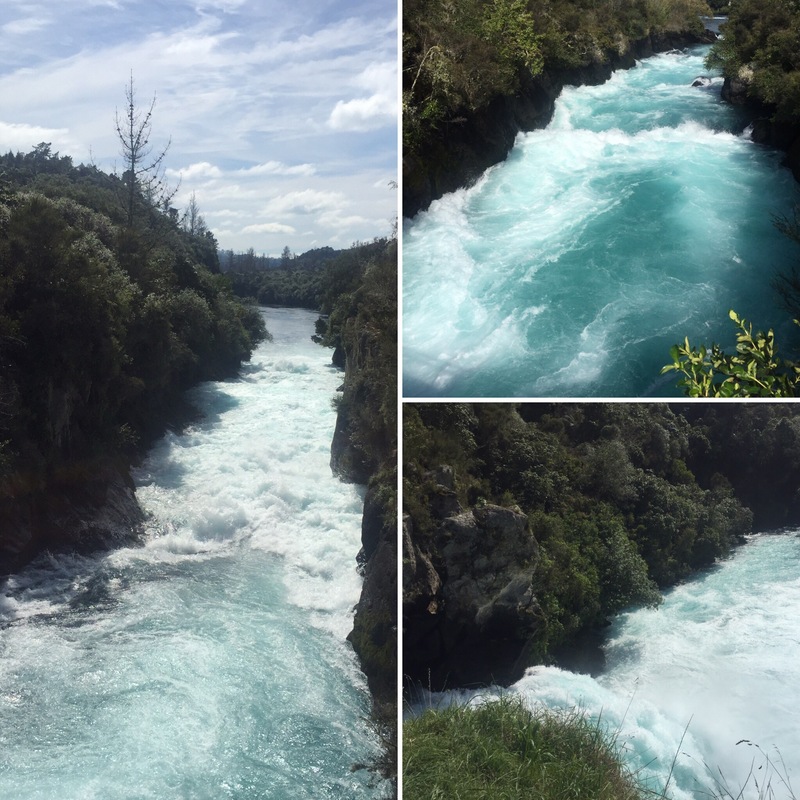 On our way to Taupo we stopped at the Huka Falls. 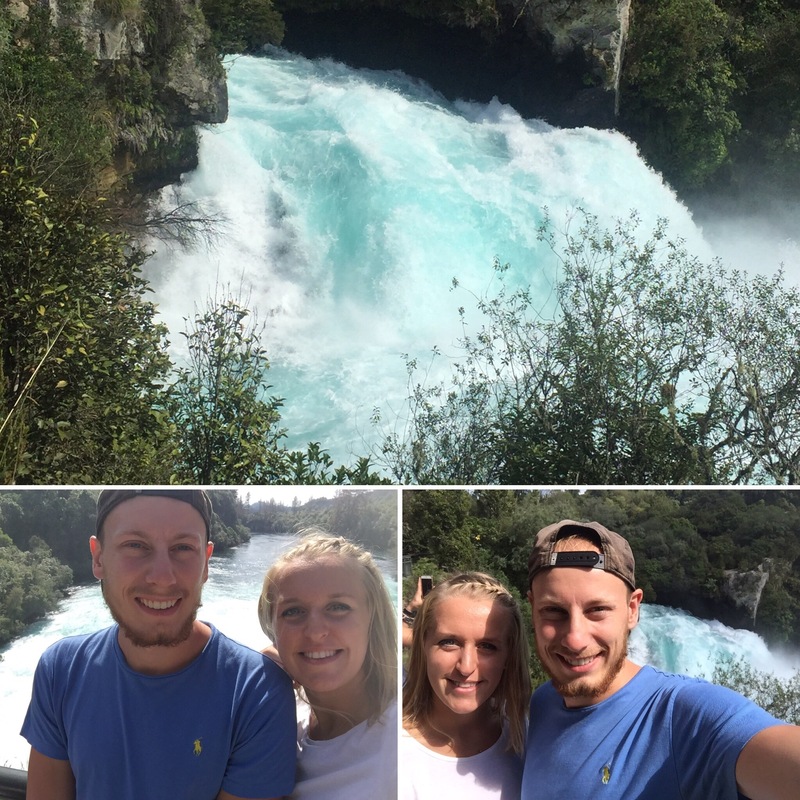 This is a really powerful, fairly short (only 9m) waterfall that throws 200,000 litres of water over it every second! I think that’s pretty impressive and that volume of water did produce a huge amount of white froth and create some pretty dangerous rapids! 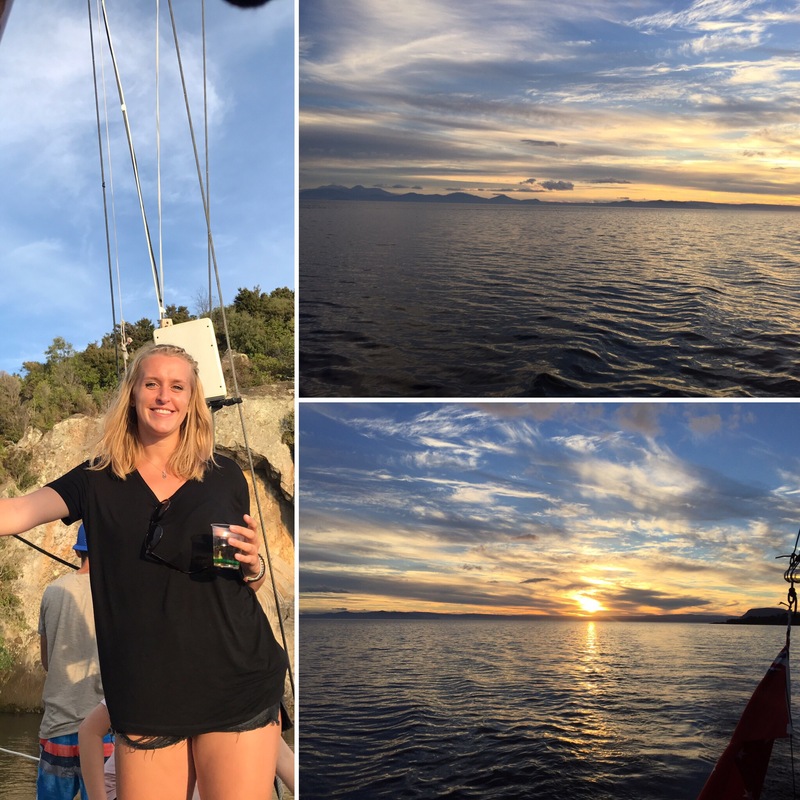 As it was just a stop off, we didn’t spend very long here before getting back on the bus to get to Taupo but I’m glad we made the stop. 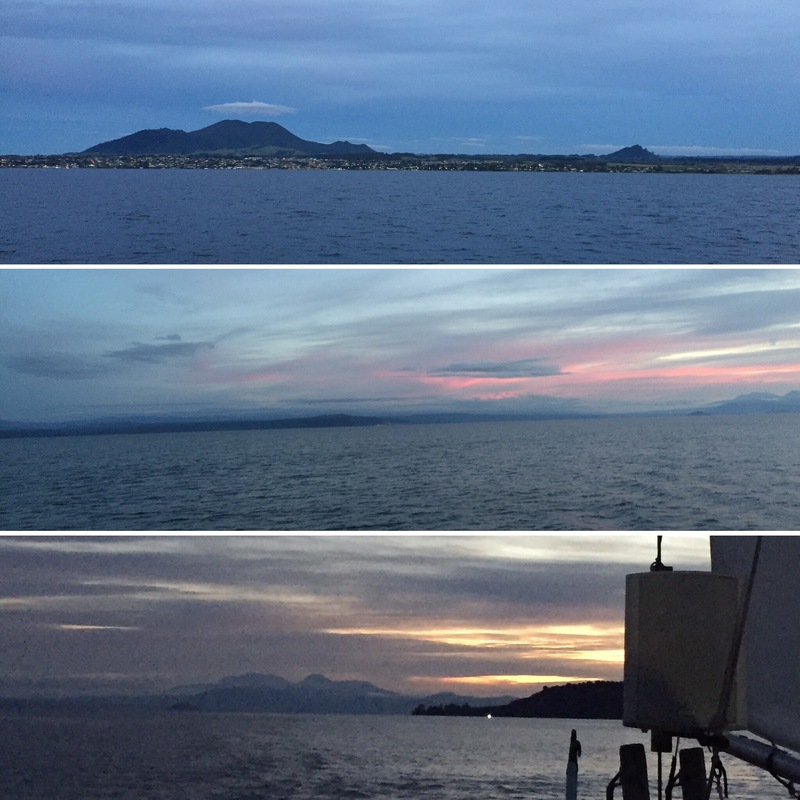 Taupo is named after the giant lake its next to (or maybe the lake is named after the town, I’m not 100% sure). 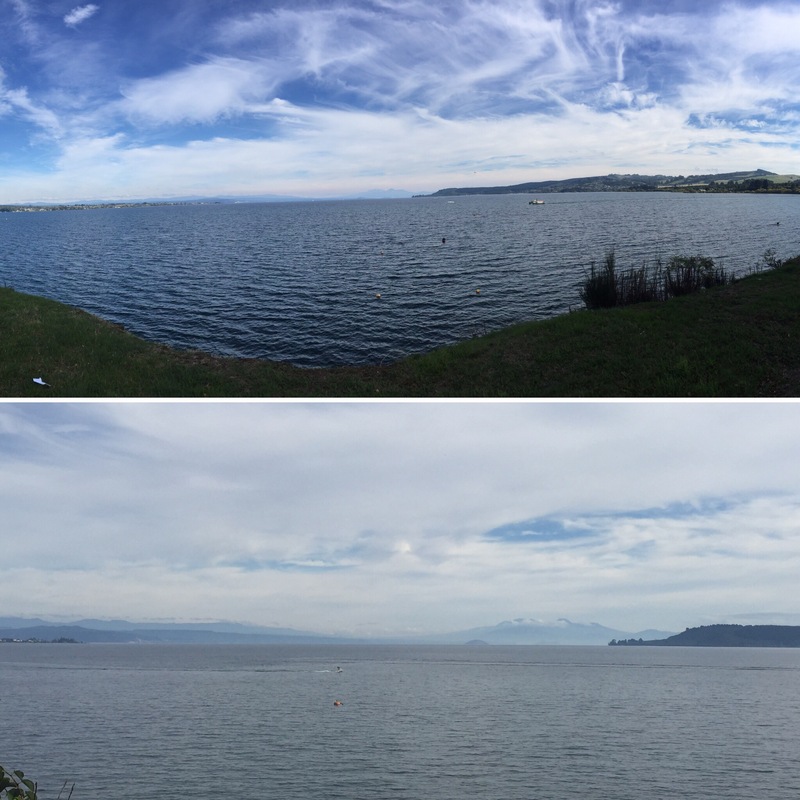 Lake Taupo is a crater lake and is actually part of a huge, dormant volcano. 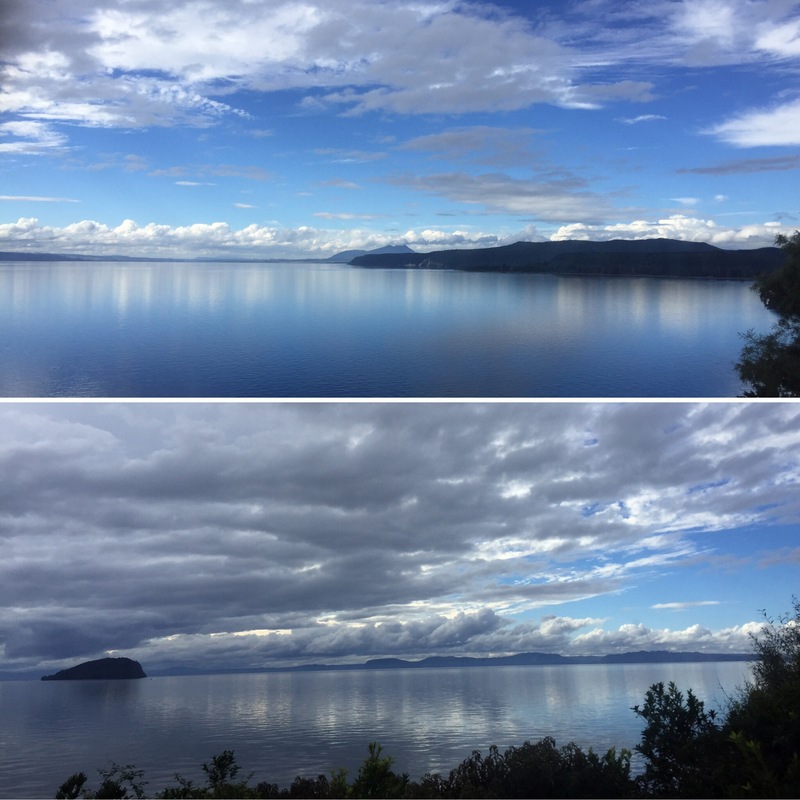 The lake is beautiful and often has really calm water which we really liked just sitting and looking out over – for the lake alone Taupo is work a stop off. That evening we joined a lot of our Kiwi Experience bus on a boat cruise on the lake. 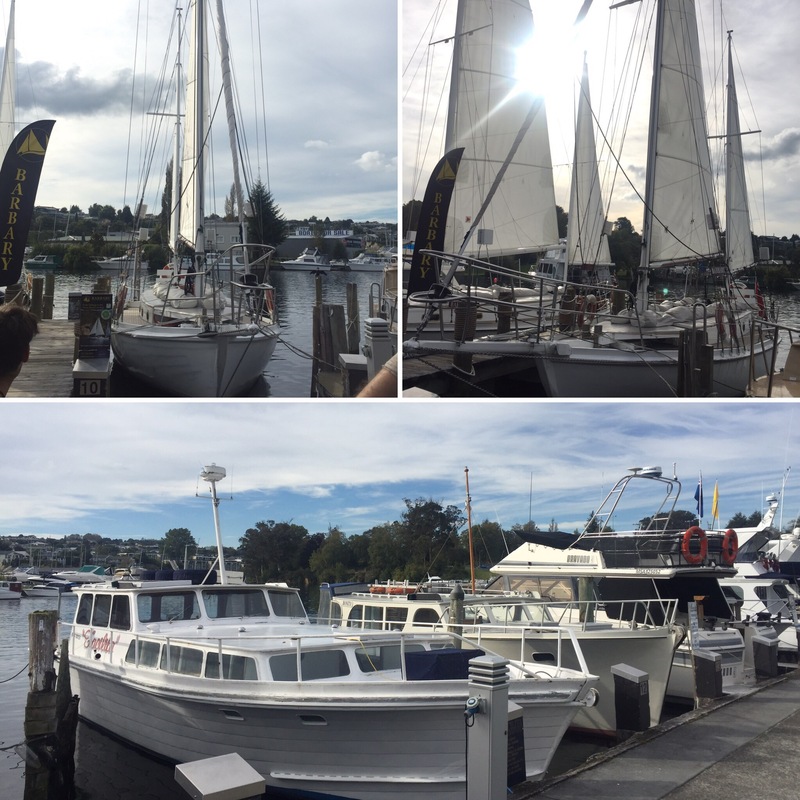 We boarded the Barbary Charters which is a sailing boat and we spent the next few hours getting to see the lake and getting to know one another. 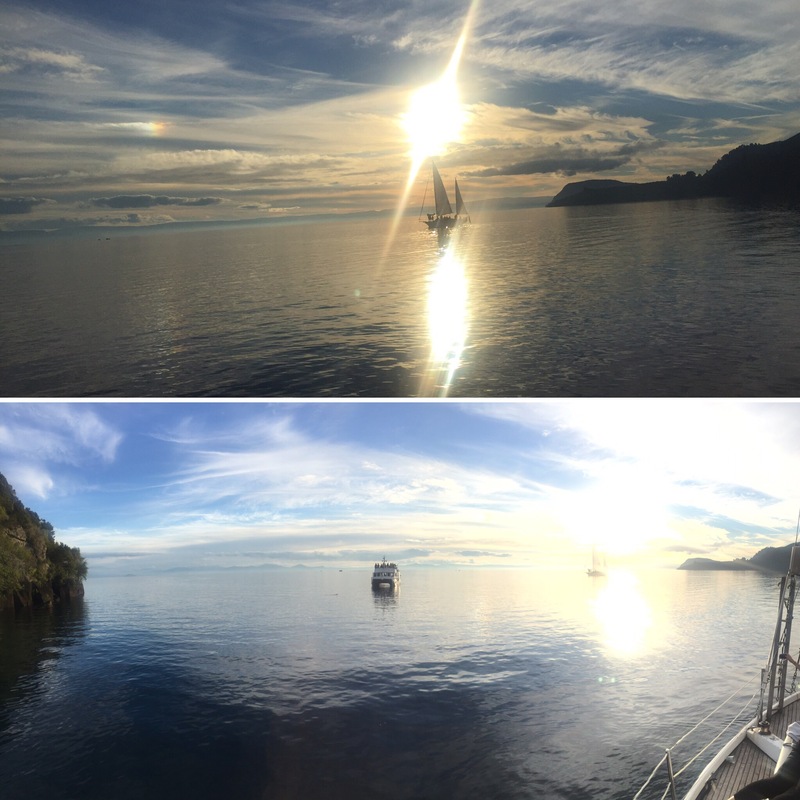 The boat had bean bags to sit on and everyone sat around the edge of the boat looking out onto the lake. 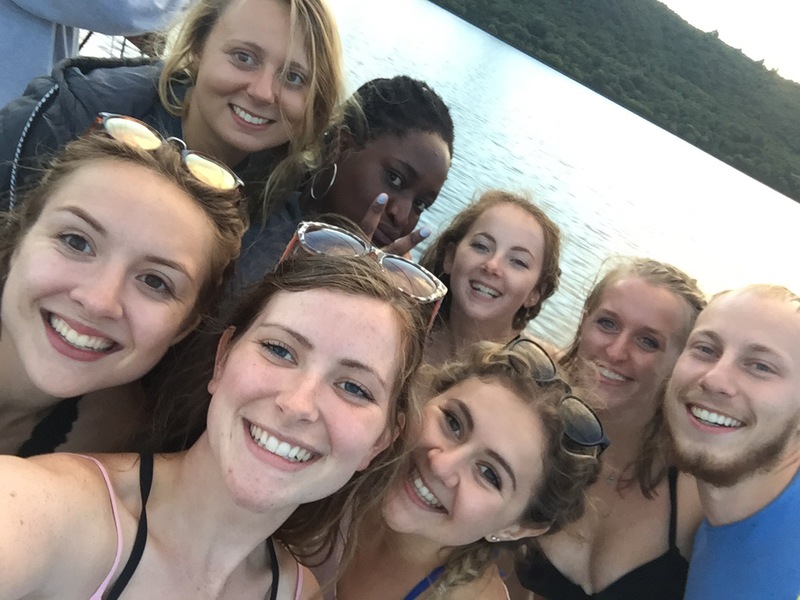 Included in the price was pizza and the boat company had got a range of different Pizza Hut pizza’s so that it worked out we could all eat half a pizza each! A girl from our bus, Safia, kindly shared a veggie one with me which was good for Niall as it meant he could have a meat pizza. The boat played music and everyone had bought some drinks so it was a nice atmosphere on the boat. 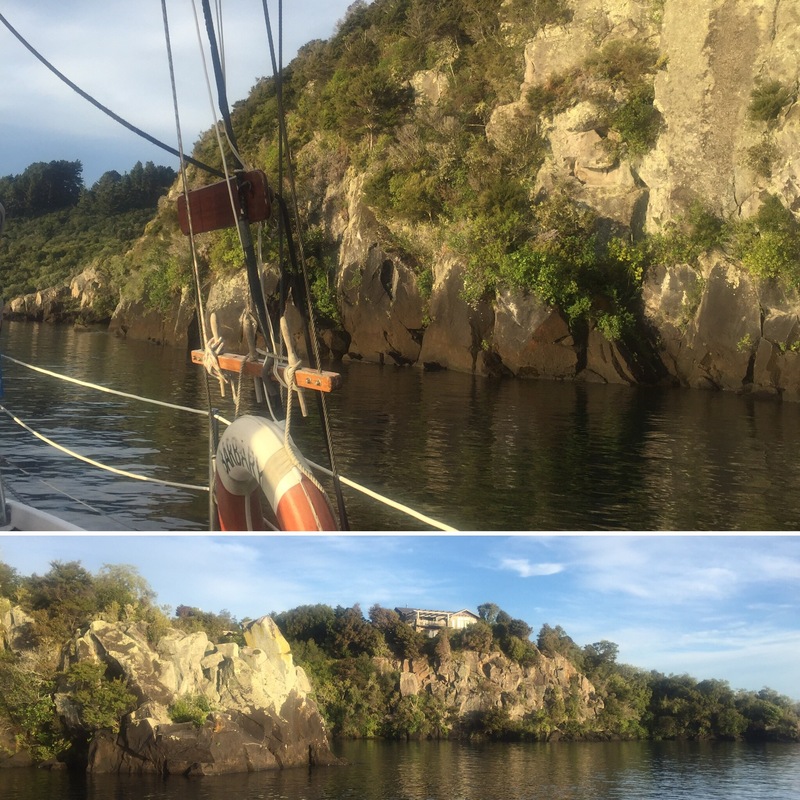 We headed to a part of the lake that had giant rock carvings that had been done in the 1970s so not actually very long ago. 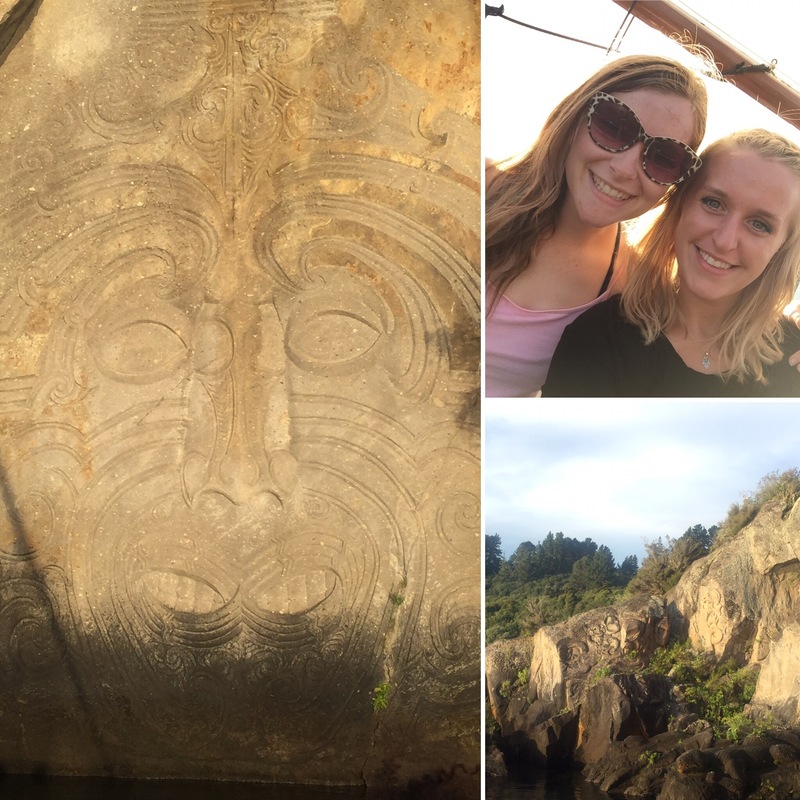 When I had first heard we would be going to see some rock carvings, I thought they would be some ancient Maori designs instead of a hippy on a boat but the carvings were really impressive all the same and one of them was massive across the whole face of the rock so it was really cool to see. 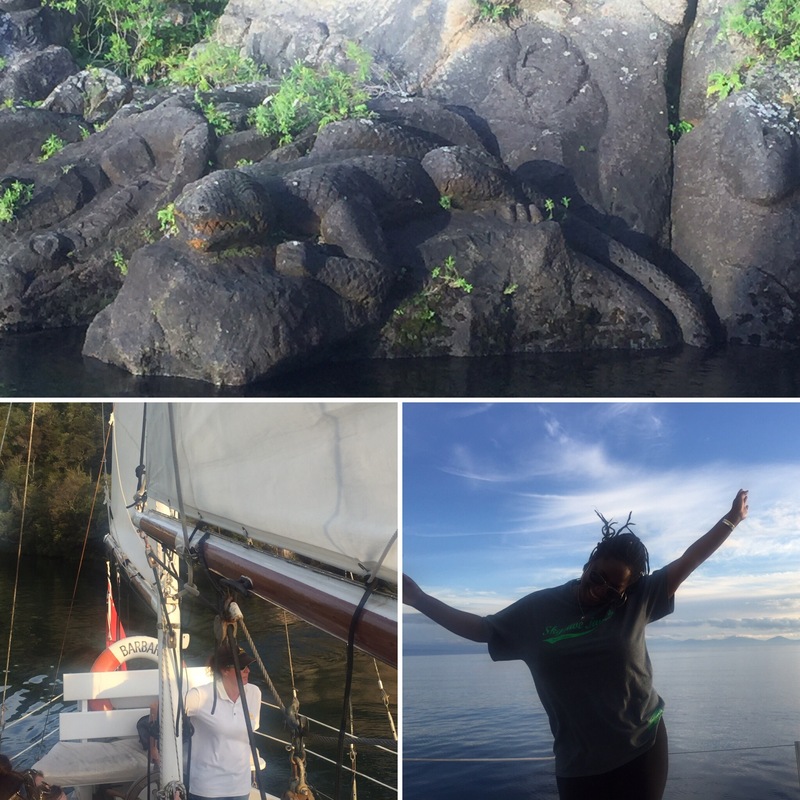 After being shown the rock carvings we dropped anchor and had some time to swim in the lake. 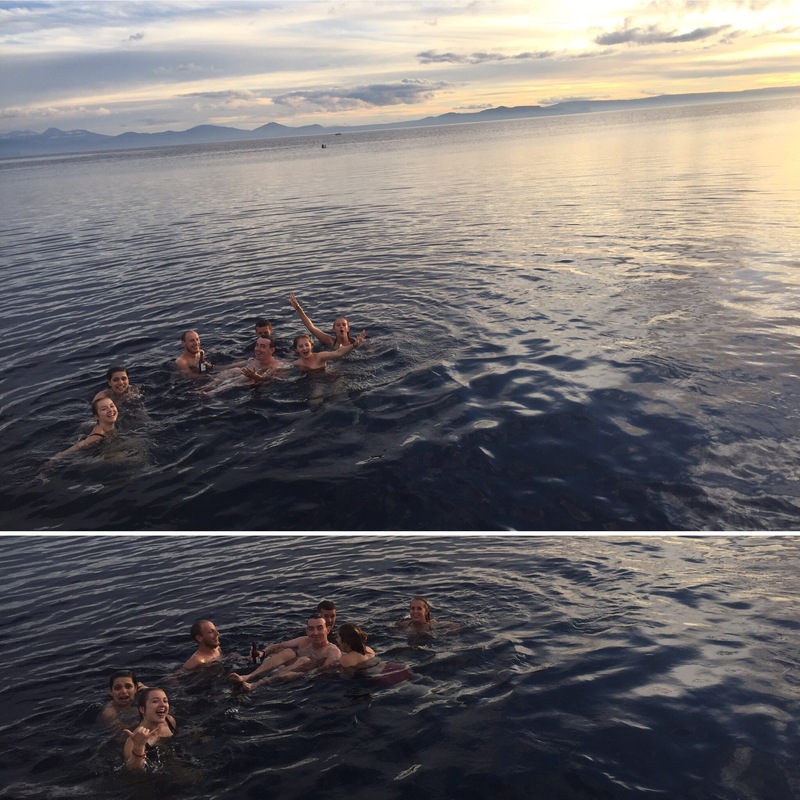 Some people jumped in straight away but we had to psych ourselves up for it as we knew it would be cold! 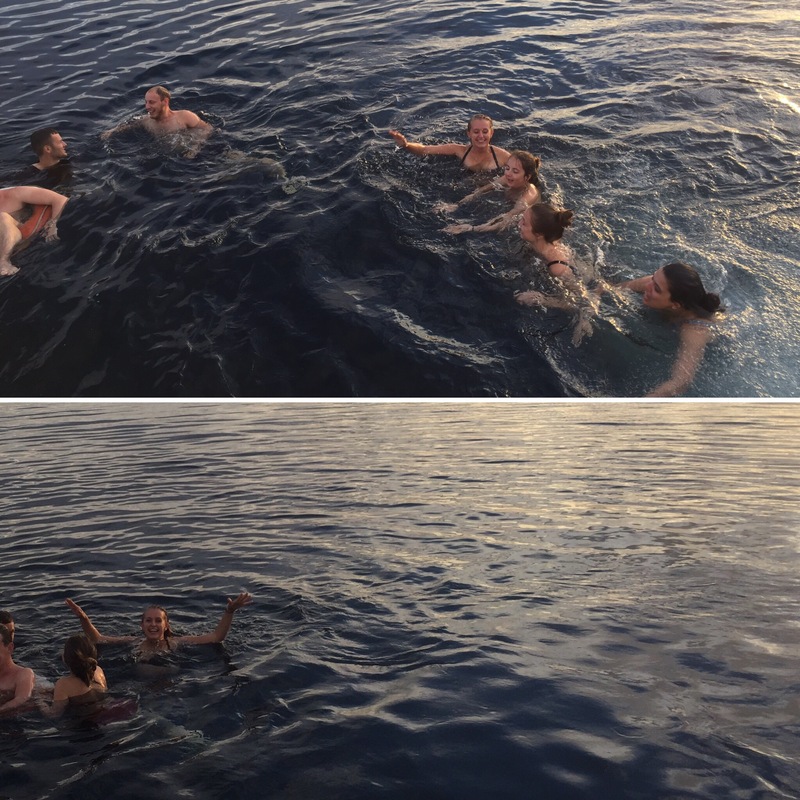 It was getting a bit cold as it was getting dark but then we thought, it’s our chance to swim in a lake on a volcano and we may never be at that Lake again so we went for it! It was a girl we were travelling with, Faye’s, birthday and we were able to convince her to jump in with us. 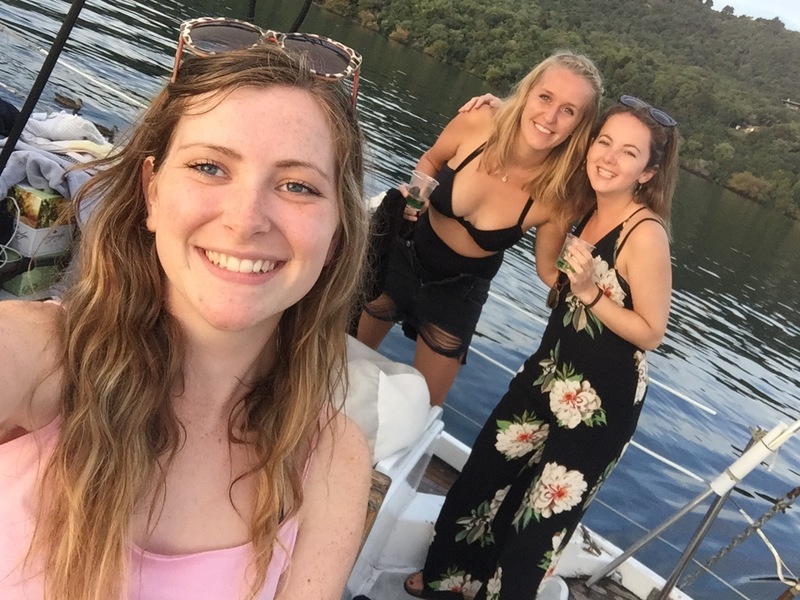 This was an extra big thing for her as she isn’t a confident swimmer and it did involve some assurances from myself and her friend Sophie that we would be her personal lifeguards in the lake. 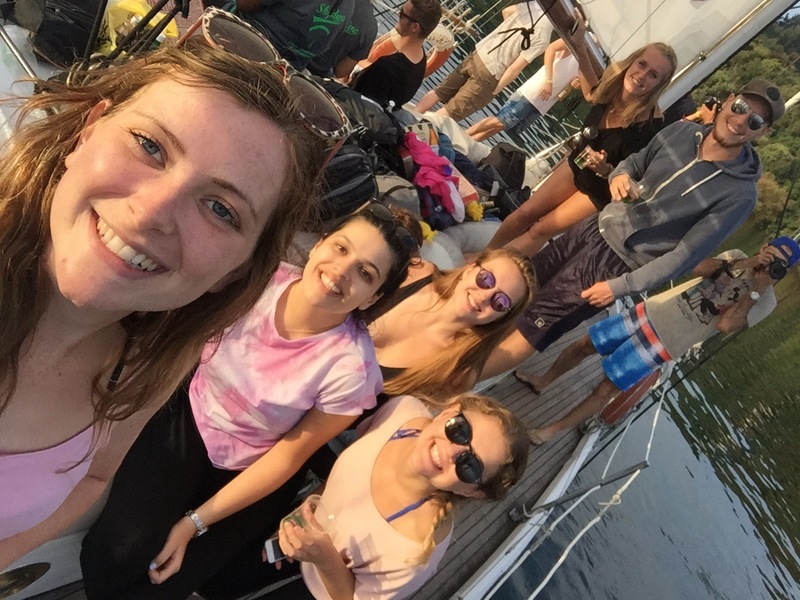 We all jumped in together and we got a pleasant surprise as the water didn’t end up being as cold as we had expected! 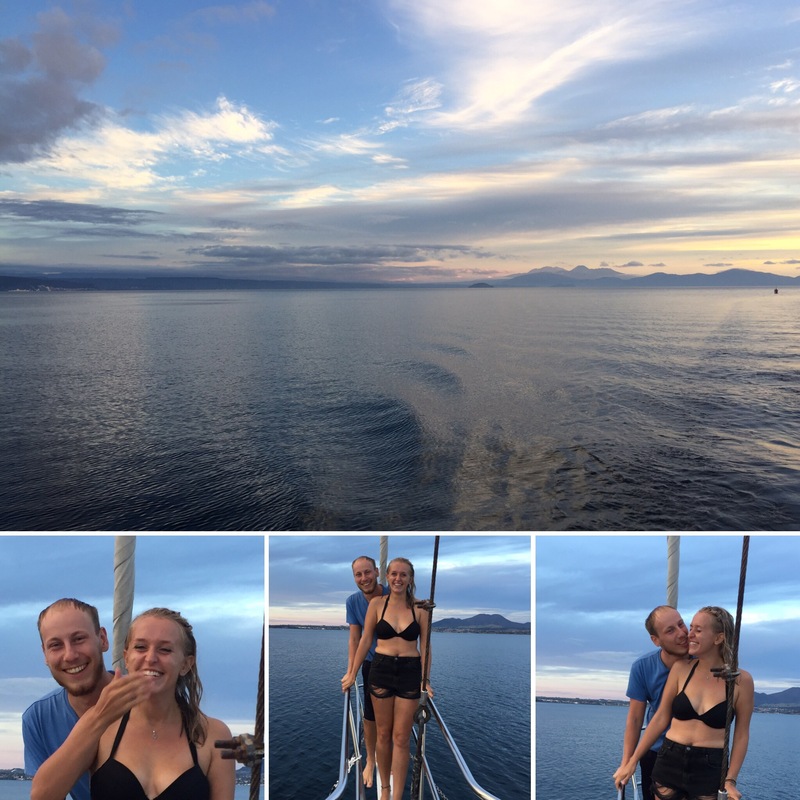 We then spent a little while floating about in the water whilst the sun started to set. It was so much fun and I’m so glad we did it! 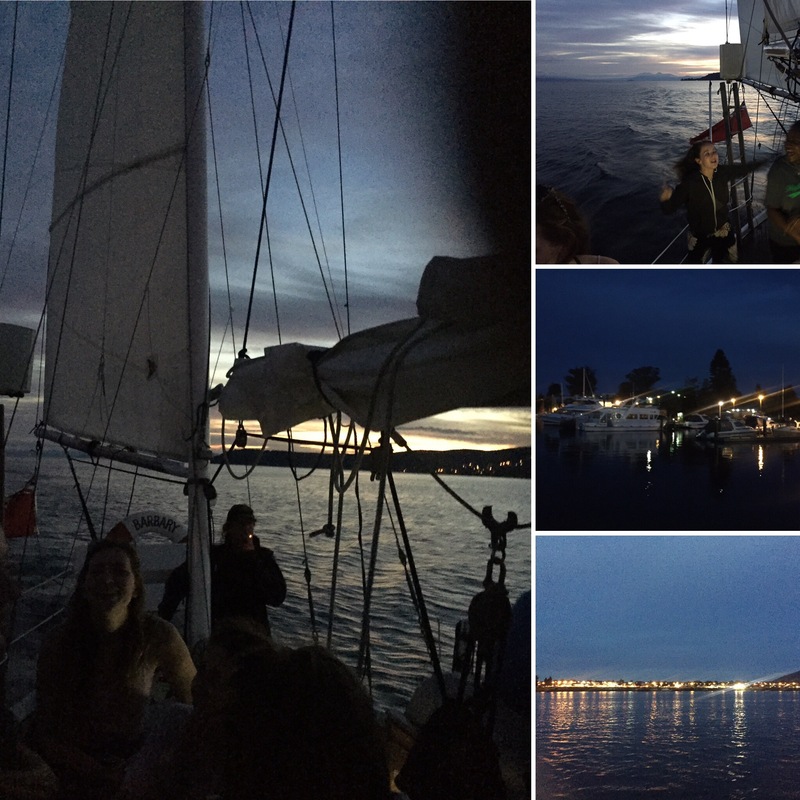 After us all swimming, we raised the anchor and played more music as we headed back to land. It was time for the sing along classic and we all sang and dances to everything from ‘like a virgin’ to ‘living on a prayer’ and ended with a number of Queen’s hits. Safia had also bought Faye a birthday cake so we even got to have some of that which was a lovely little bonus! 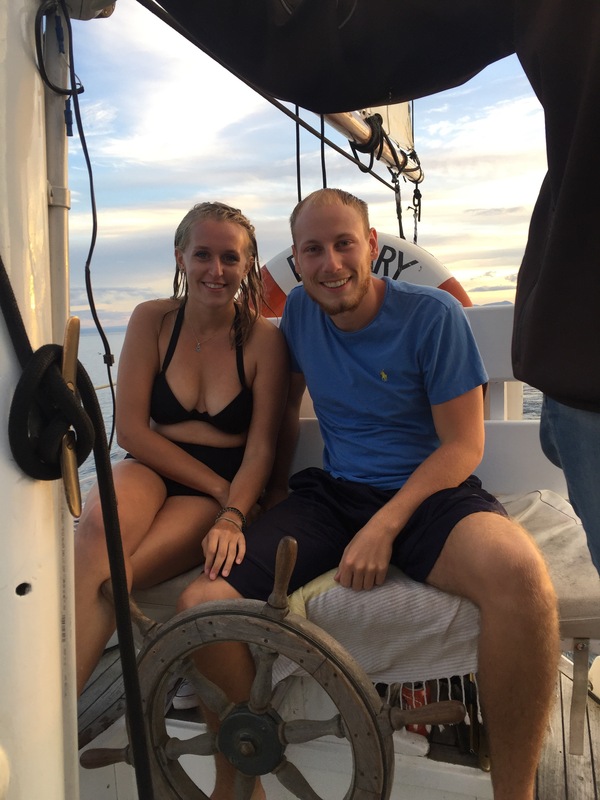 The boat trip was so much fun and a perfect way to get to know the people we would be spending at least the next few stops on the Kiwi Experience travelling with. 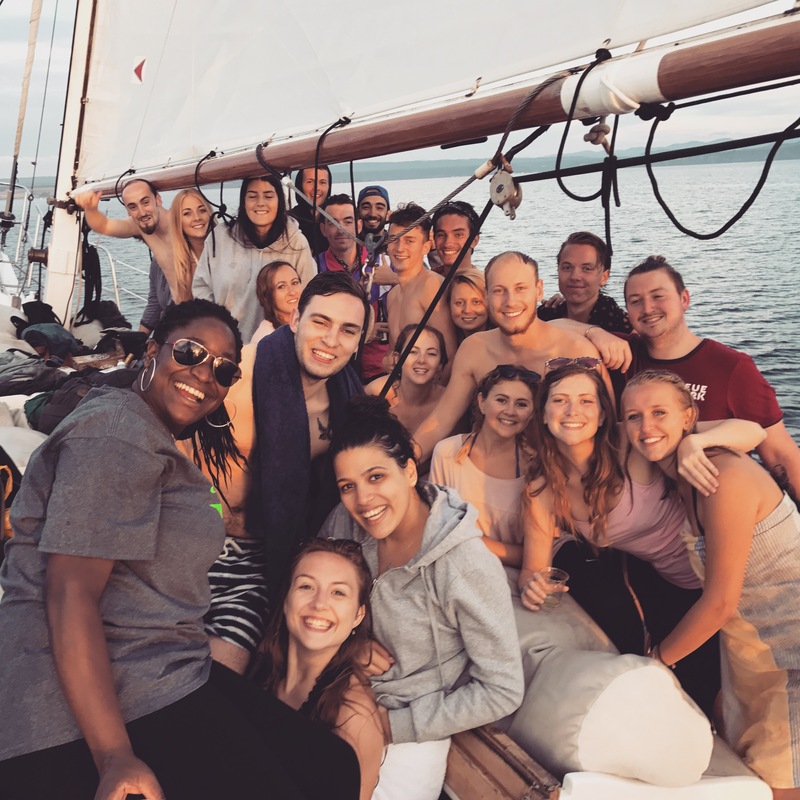 It was great being out on the lake and we thoroughly enjoyed the evening and spending time with the group of people we were with. 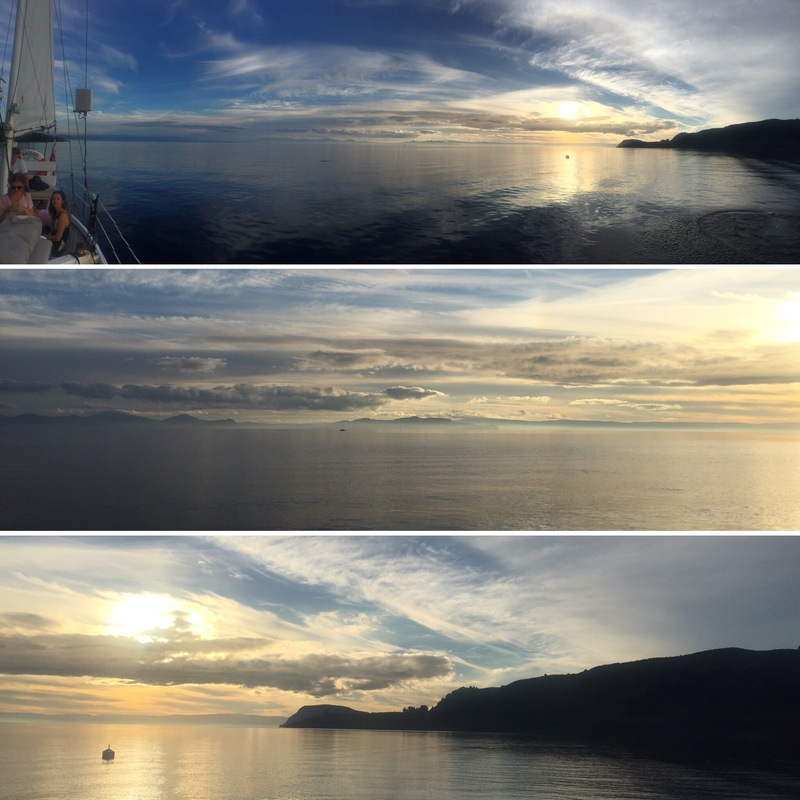 After we got back to shore we went for a drinks with the people we were sharing our room with; Brendan, Connor, Aser and Nicky. 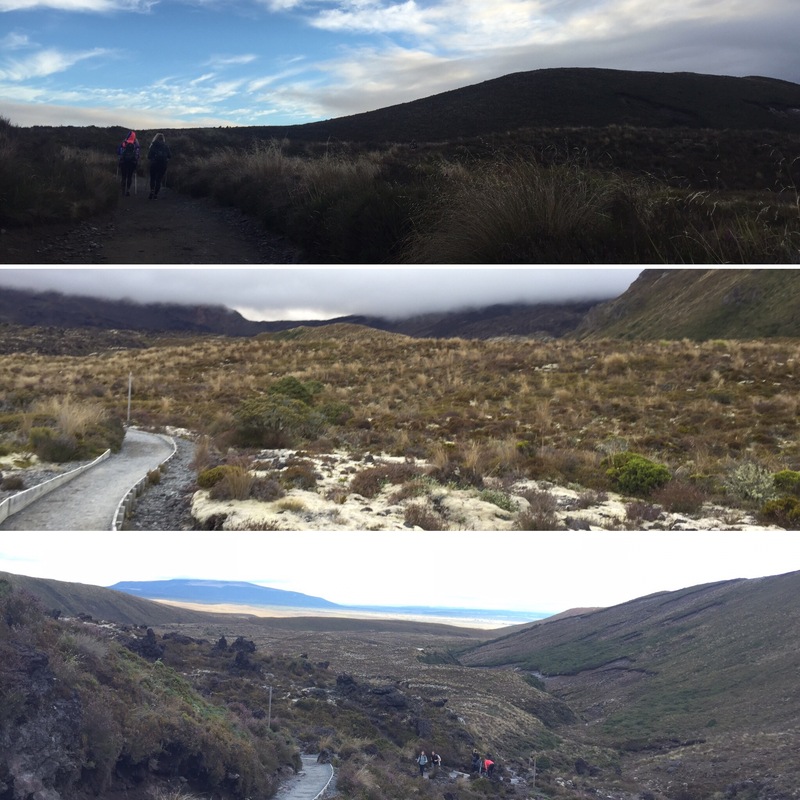 All of us had an early start the next day so we didn’t stay out for long as we wanted to get as much sleep as possible before tackling the Tongariro Crossing. 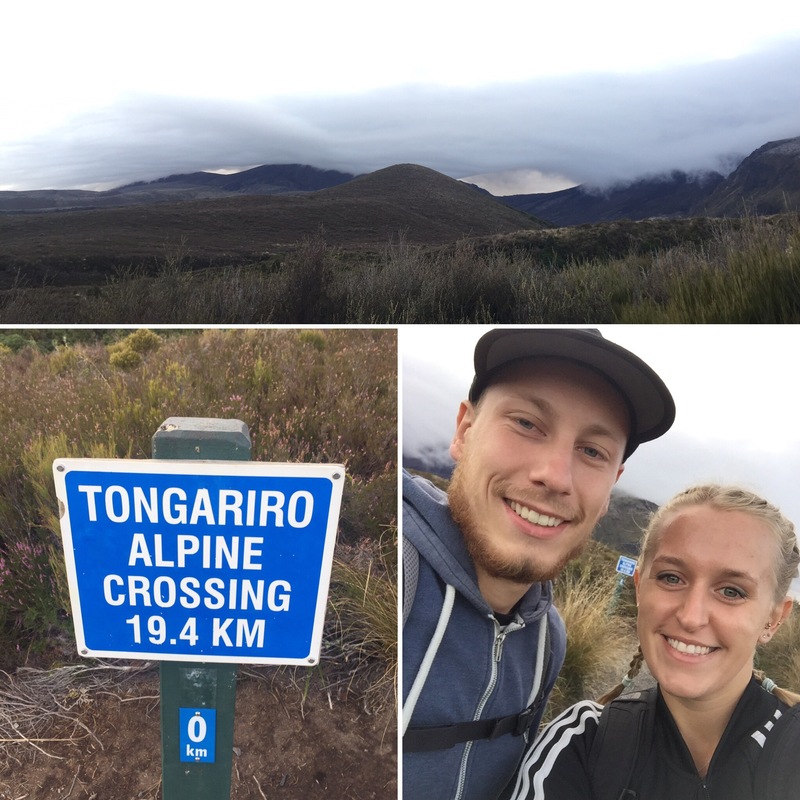 On the 2nd April 2017, we got up at 4:45am to catch the bus to the Tongariro Crossing. 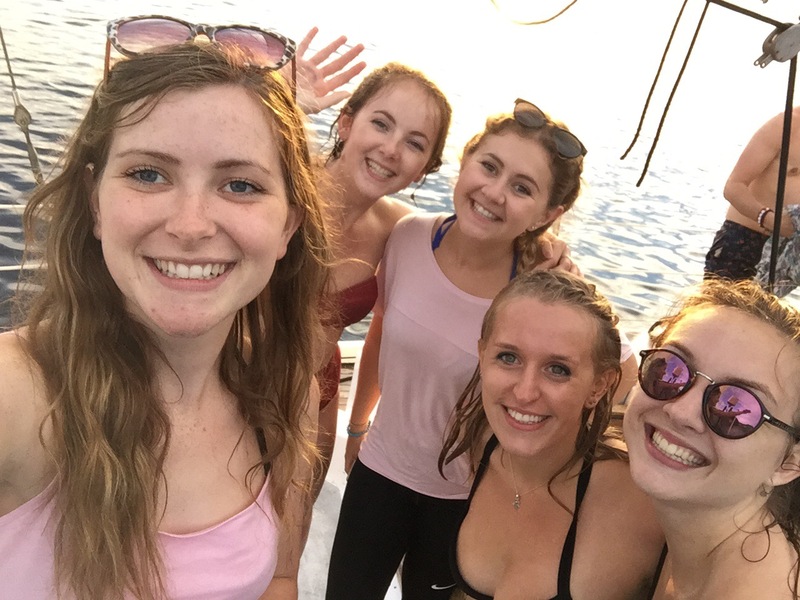 We were really looking forward to doing the walk because we had heard how amazing the views were so we were hoping to have clear, sunny weather. 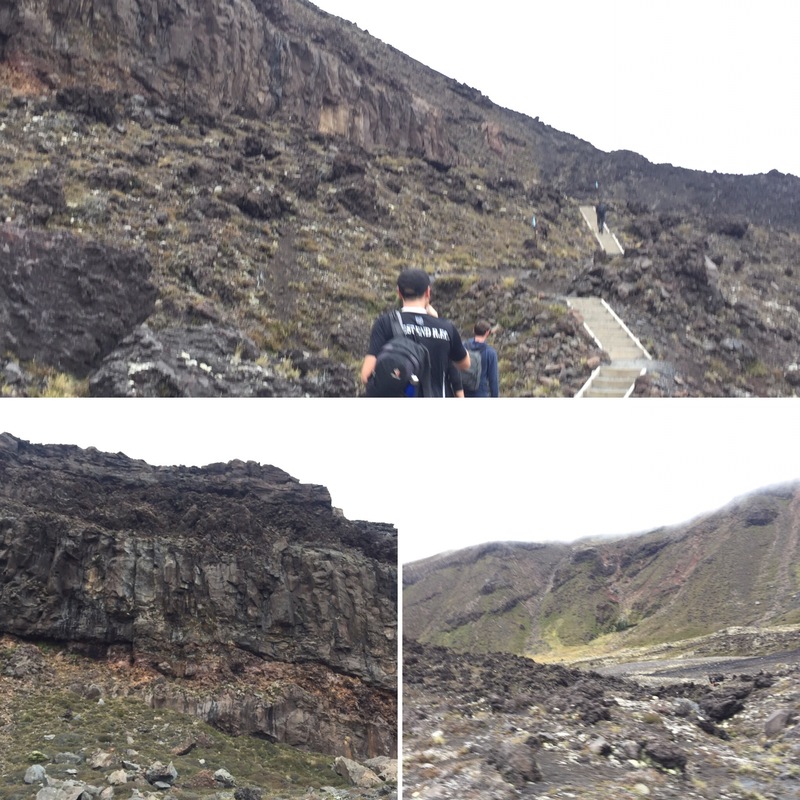 The walk was going to be 19.4km long and take us around 6 hours to complete so it was going to be a long day. The walk started at 7:08am and the weather was looking promising so we felt optimistic for the long day ahead. We headed along the dirt path through an enormous canyon and started the ascent that would last most of the day. 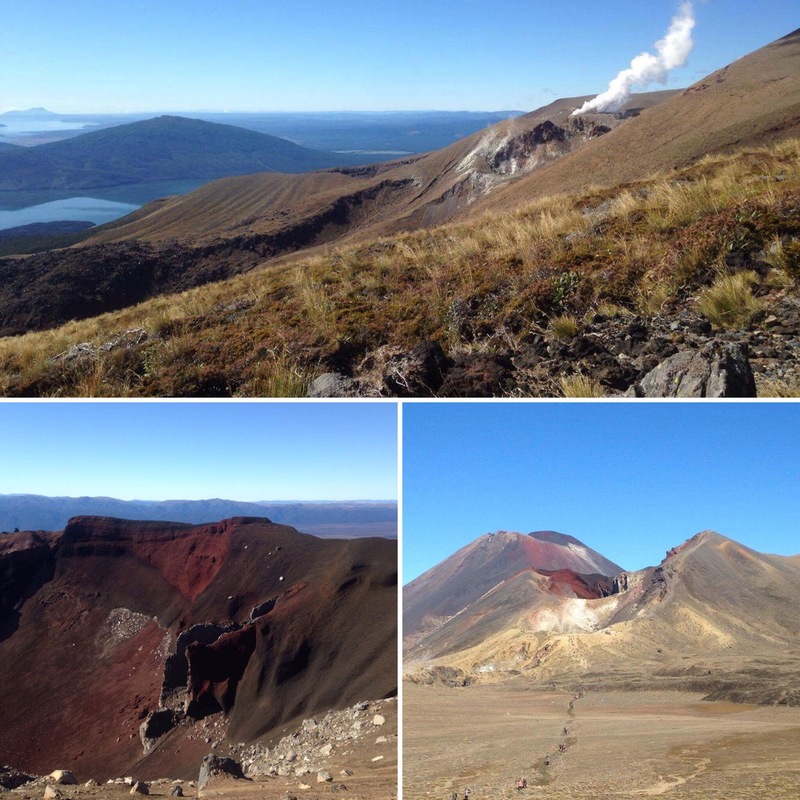 You could instantly see the vastness of the National Park and the evidence of volcanic activity in the area. The first hurdle of our journey was the Devil’s Staircase which are lots of really steep steps which gets you pretty high really fast. Niall cruised up these stairs but I found it a bit more tiring! This was when we started to get our bad weather. 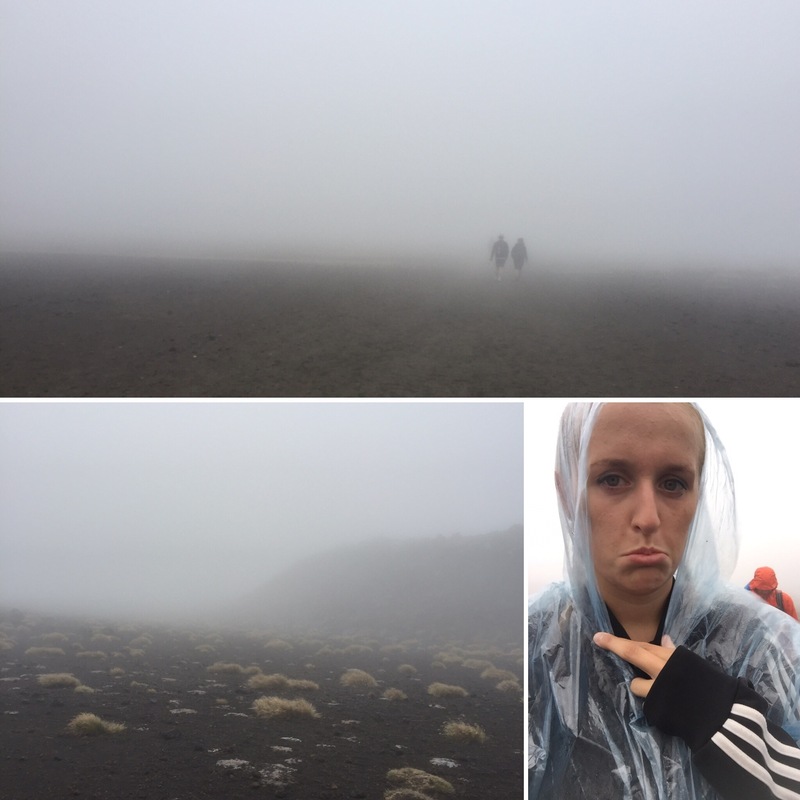 We headed straight into a giant cloud that would consume our view for the rest of the day. The rain became really heavy (bare in mind we only had ponchos and our hoodies) and it started to get quite a bit colder seeing as we were so high up. 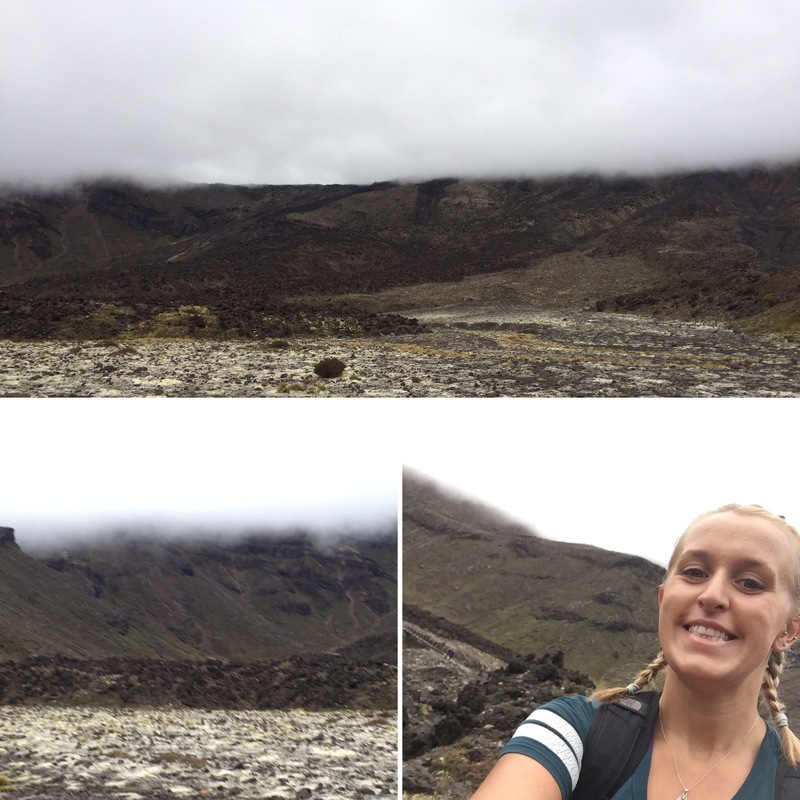 The cloud was so thick and the visibility was so bad that we couldn’t see Mount Doom from Lord of the Rings (a famous site on the walk) and only knew we’d passed it because of the sign! 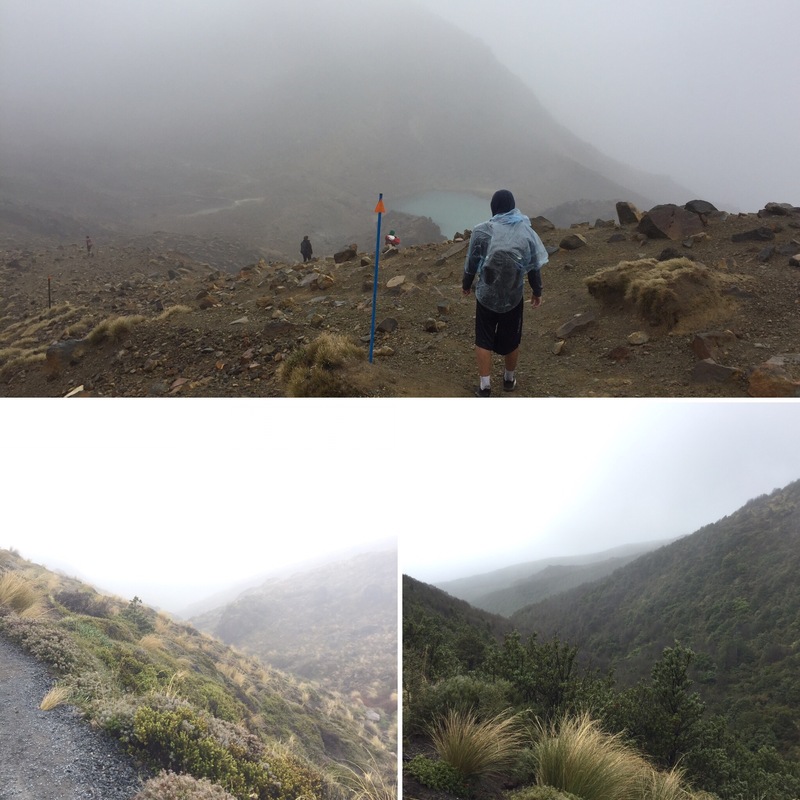 In all honesty, it was a pointless day of walking for hours with nothing to see except grey cloud. It was wet, cold and we were really fed up. 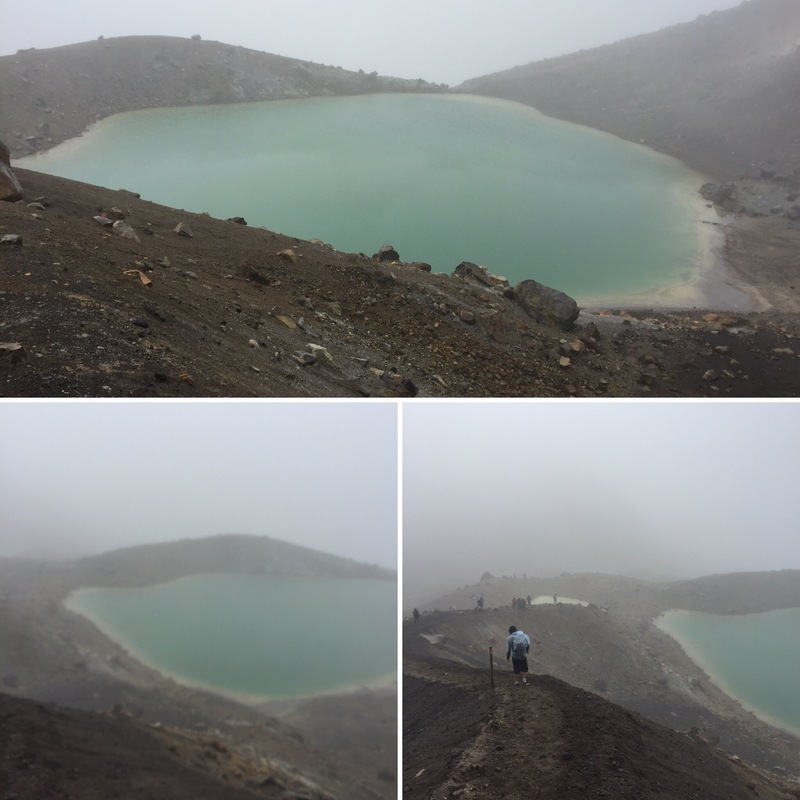 We passed two giant lakes that were bright turquoise – we could just see it through the cloud! 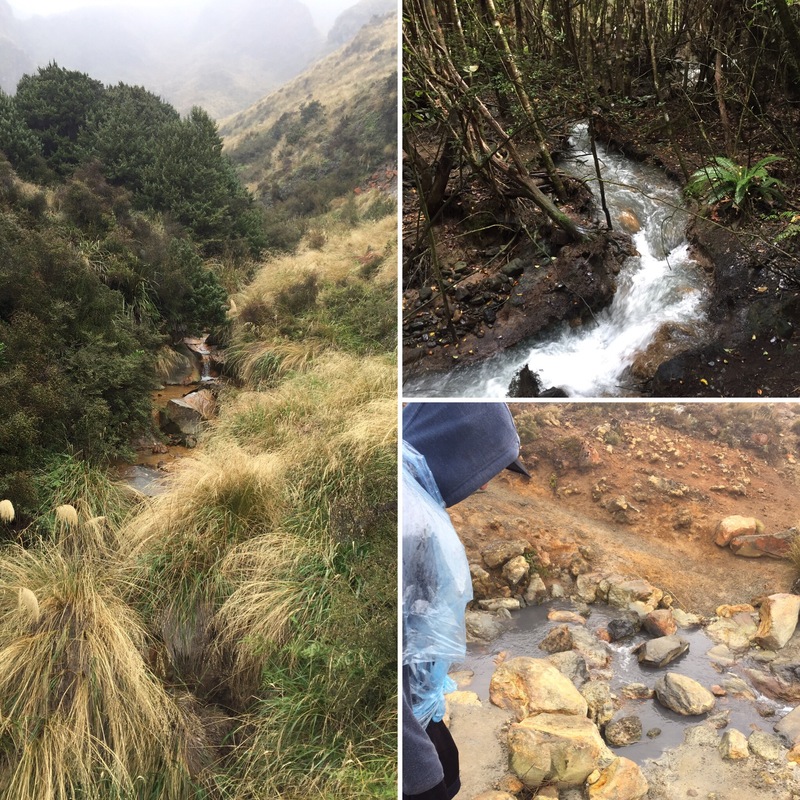 The route was also really slippery and I actually fell and hurt myself at one point along the walk. Safe to say, morale was low. Because we didn’t stop, not even to eat food as we just wanted to get out of the rain, we did the whole walk by 12:30 so it took us just under 5 and a half hours to do it which isn’t a bad time at all when people say it usually takes between 6-8 hours to do. My shoulders and knees were hurting and we were both feeling very damp and fed up. Niall didn’t find the walk physically that bad but I was really tired by the end – he is a lot fitter than me though. 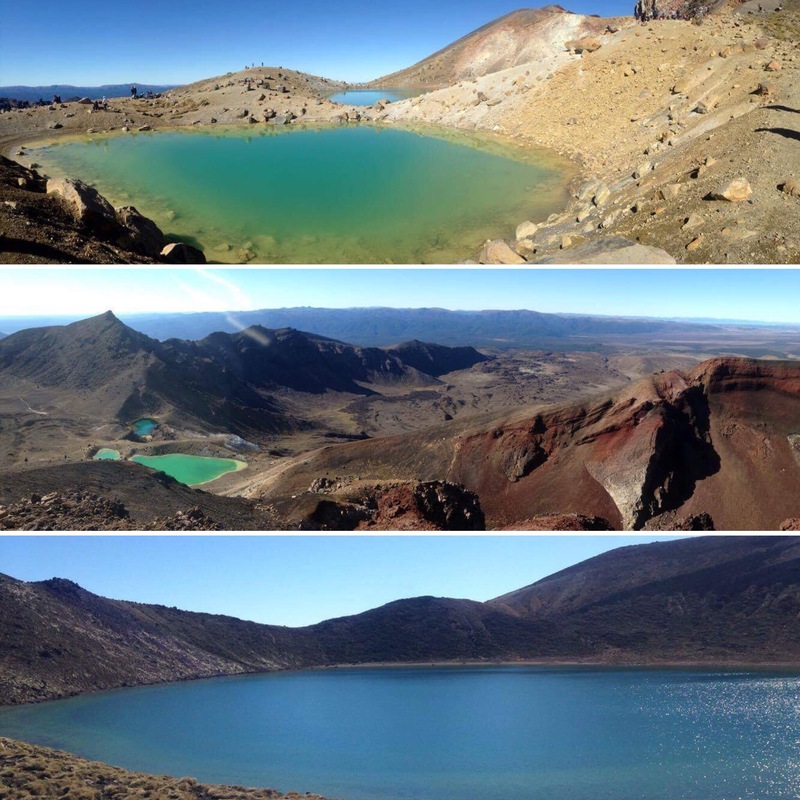 I think, if we had been wanting to do the Tongariro Crossing for the achievement of the walk, then maybe we would have still enjoyed it. However, we went for the views and aren’t bothered about doing long walks for the sake of walking – we need a good view to make it worth while! Because of this, it was a waste of time and we just had bad luck that we did the Crossing the day we did it as a lot of people we know had great weather for their hike. 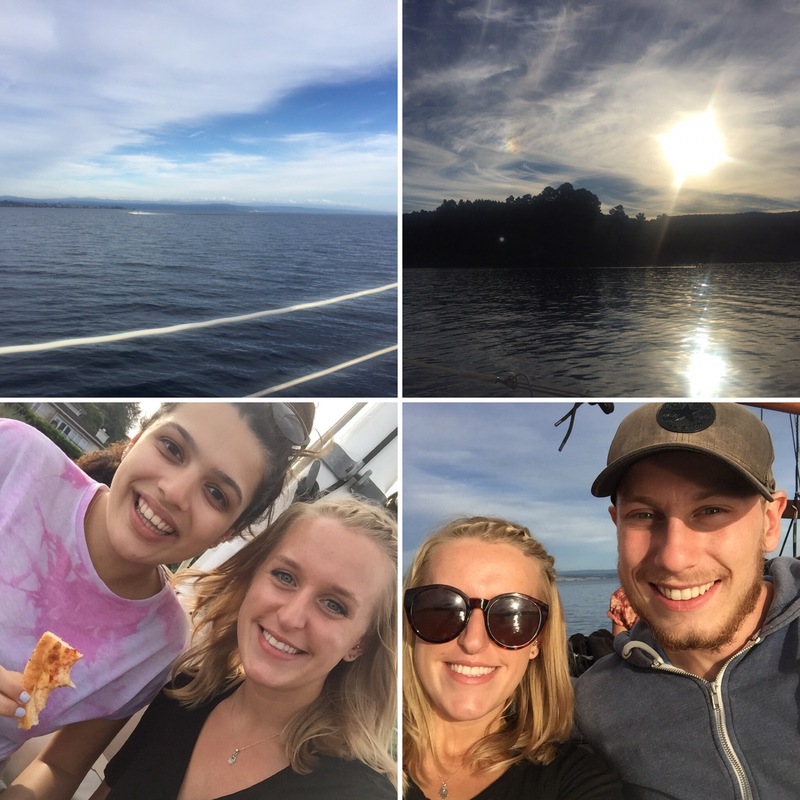 It was a shame but, apart from that, we really enjoyed Taupo and, if that was the first thing we had really hated since we started our trip, then that’s pretty good going! 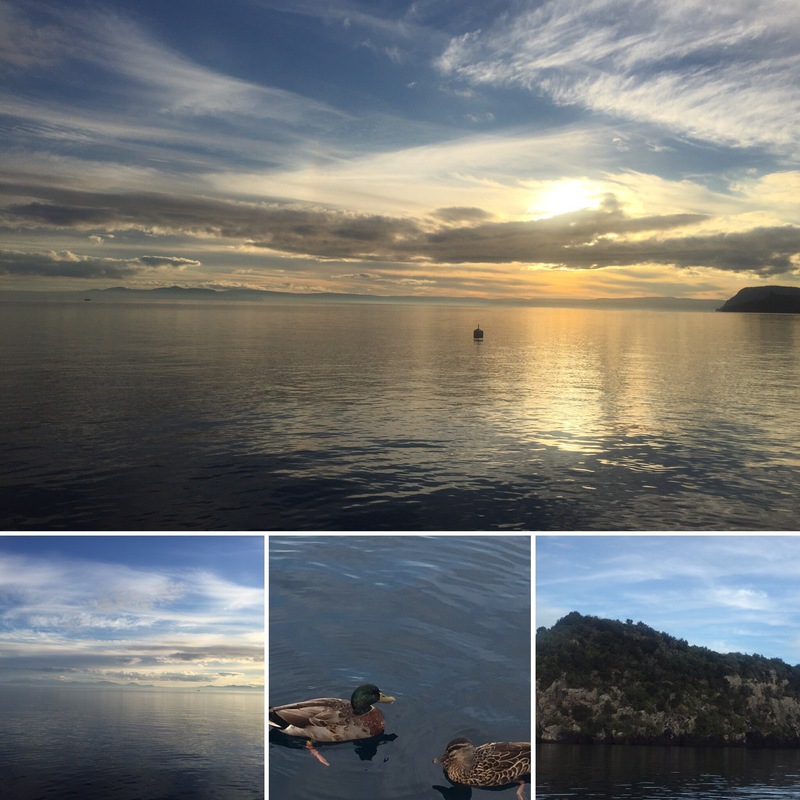 We spent our last evening enjoying the sunset over Lake Taupo – something I don’t think I’d ever get bored of! 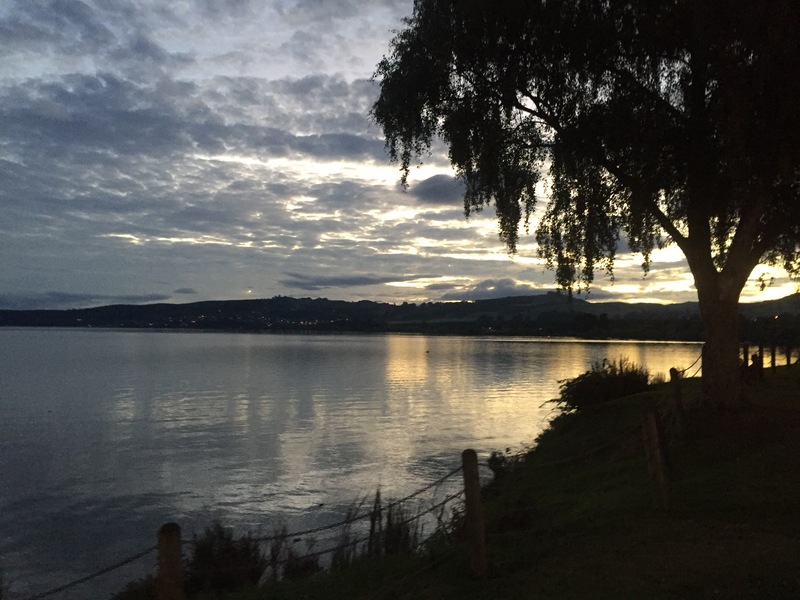 Taupo is a really nice little town and definitely worth a visit even if you just stay for a night or two. I would go again just to look out onto that beautiful lake!